The photo up above is what I call, "beautiful chaos"..
Why is it beautiful to me? Because we began cleaning out our home today. No, we aren't hoarders although, one room and most of the closets in my home certainly look like we are. We've lived in this home for sixteen years and we have had one room that has been nothing but a "catch all" room ever since. It's been packed from floor to almost ceiling for all these years and finally today I decided to bite the bullet and go in. Usually I look at that room, get overwhelmed, shut the door and walk away. 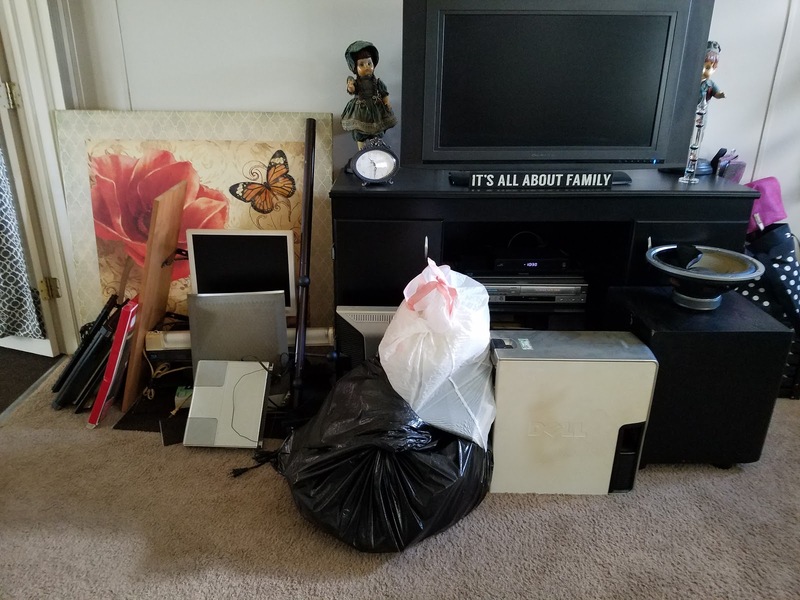 For some odd reason, this morning I couldn't stand it anymore so I began cleaning out with the help of my husband and I have to say, I'm quite proud of him. My husband is a pack rat. He's a "what if" man. I'm sure many of you have "what if people" in your lives, you may even be a " what if person". Still not sure what type of person that is? It's the type of person who hangs on to everything because "What if I need it someday?".. That's a what if person. I used to be such a person but over the last four years I've changed. I don't worry about "someday" I think about now and if I haven't touched it in two years or in this case as many as ten then I definitely do not need it and out it goes. My husband on the other hand saves every darn thing but this morning, he actually sat down with me and when he would say, "Oh don't get rid of that", my response was, "why? ", "well I may..." , "no honey, you haven't used it in many years you really don't need this anymore" and to my absolute shock he agreed with me! So out it went. After we got done picking through what was to sell or go to the dump. we rested for a bit and then this afternoon when the sun went in, it's been very hot and humid here in the South, we beat it for the dump. Loaded the car and then unloaded everything at the dump. I don't know about the Mr but I feel somewhat lighter.. There's still more to go in that one room but at least it's a real start now and although tonight I am in a monster amount of body pain, to me it was worth it. I just hope I feel the same way in the morning.. LOL.. I love cleaning out the crap we think we don't need.